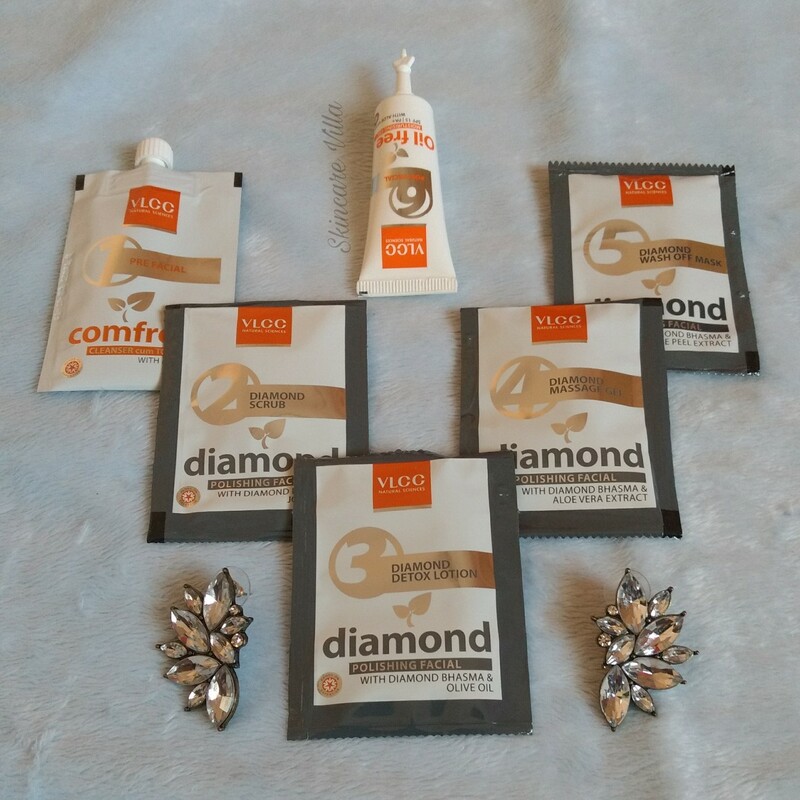 Weekends call in for some pampering and I this weekend I just enjoyed a home facial with VLCC Diamond Facial Kit. I had never tried a proper facial at home apart from a facial massage with The Nature's Co Multi-Vitamin Facial Massage Cream. I experienced a relaxing me time while using the facial kit. 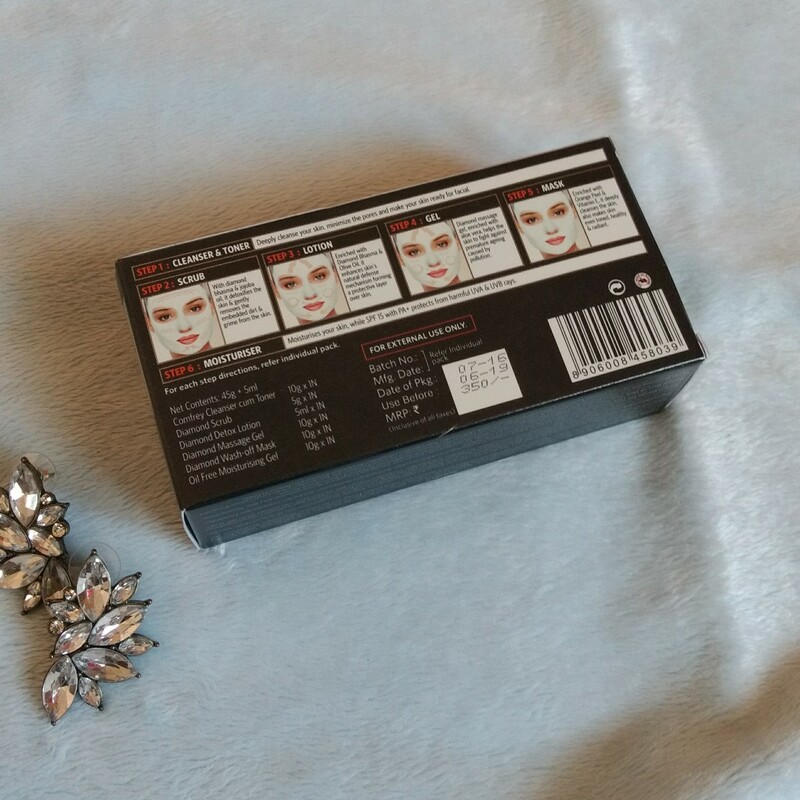 Let's take a look at the contents and effects of the facial kit. The cleanser is to be massaged into the skin for a few minutes and then wiped off with moist cotton. The cleanser is of glue consistency and white in colour with thick and smooth texture. It gets absorbed in the skin instantly after massaging and plumps up the skin. Basically this is a pre facial step so as to tone the skin for further processes. Scrub is to be massaged into the skin and wiped off with moist cotton balls. 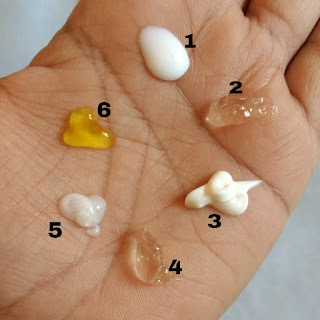 The consistency of the scrub is gel like with diamond bhasma particles in it. The scrub while massaging feels like we are scrubbing the diamond powder onto the skin. The scrub particles are very tiny yet scrub effectively and remove dead skin cells and dirt if any. The lotion is white in colour with a thin texture and medium consistency. The lotion is to be massaged well on face and neck area till it gets absorbed. Once absorbed it's not to be wiped off the face. Proceed to the next step. 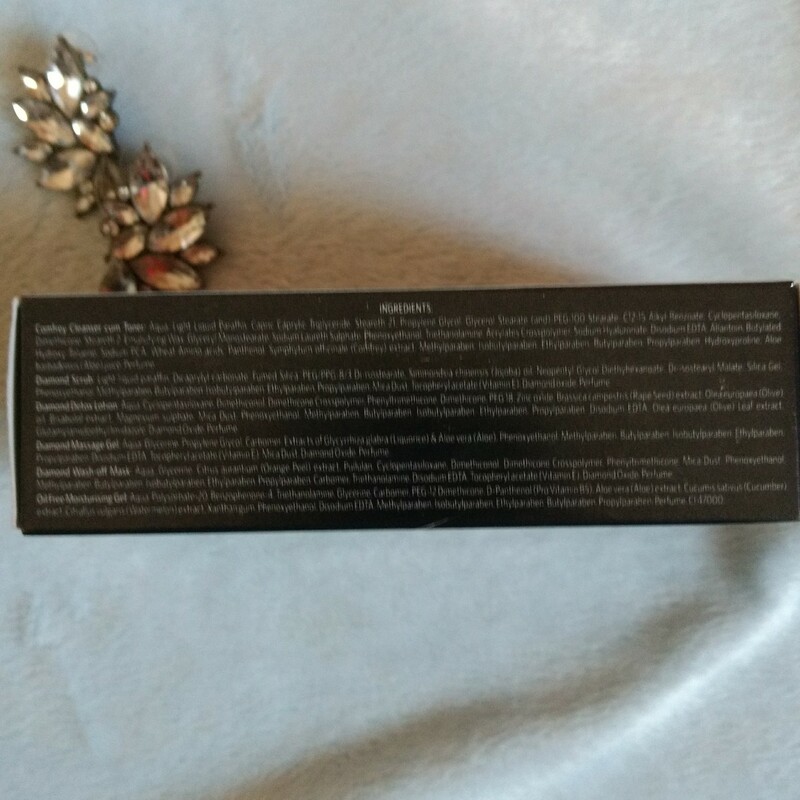 The massage gel is a transparent, thick gel with minute diamond bhasma particles in it. However they weren't like the ones in the scrub, rather they kept on swirling on the face as we massage the face. The massage gel has a very peculiar fragrance which wasn't so pleasant to me, rather it felt very artificial. The massage gel gets absorbed easily and gives a baby soft skin instantly. After massaging, the gel is to be wiped off with moist cotton. My favourite step, mask 💃. The wash off Mask has a gel consistency with opaque gel and diamond bhasma particles in it. The gel spreads easily on the skin to form a peel off Mask sort. Howover it doesn't dry up like a peel off Mask. After 15 minutes I washed off the mask and it took some time to get wahed off. Post this step my face was beaming with a glow. The oil free moisturiser is the last step of the face. It has a screw cut mechanism. The moisturising gel is sunset yellow in colour and has a gel consistency with a pleasing fragrance. The gel gets absorbed into the skin instantly giving a oil free, hydrated look to the skin. 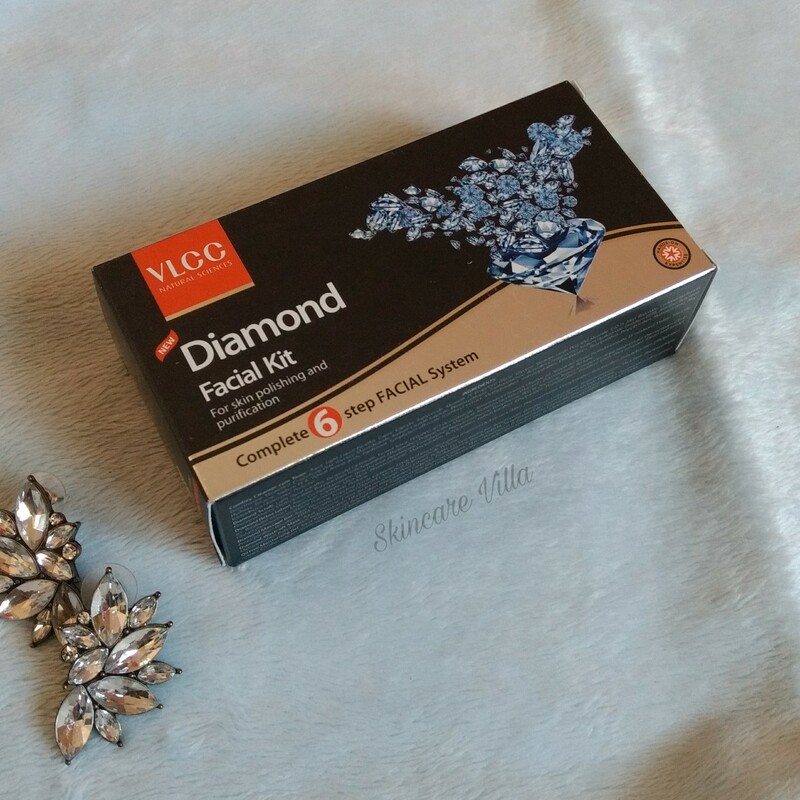 I thoroughly loved using the VLCC Diamond Facial Kit as it is good to use at home option as well as best option for on the go facial. Moreover it is easy to use and gives a radiant and soft skin which lasts for one day. The kit when stored properly will last for 3 uses as quantity offered is good. However a paraben free formulation would be highly appreciated, with the recent organic wave. 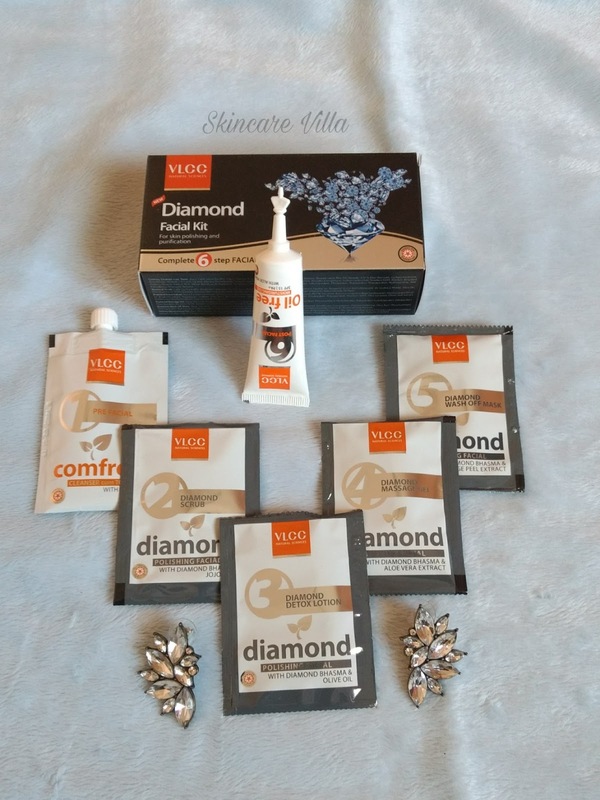 If you don't mind the paraben tag then this kit would be a highly recommended one from Skincare Villa.